The ten-volume series is meant for middle school and high school students and covers a range of topics. The titles in the series include: Divisions in Islam; History of Islam; Islam in Europe; Islam, Law and Human Rights; Islamic-Jewish Relations before 1947; Islamic Rituals and Celebrations; The Monotheistic Religions; Muslims in America; The Muslim World: An Overview; and Radical Islam. In the book about Islam in Europe, the author begins the chronology in 1988, which automatically paints the picture that Islam is new to Europe even though Islam has a history on that continent that precedes the modern day. Finally, CAIR higlighted the appearance of a picture of two covered Muslim girls on a page with the subtitle “Security Threats.” According to CAIR, it is not only the quotes that are problematic, but it is the overall message of the books. Although I have not read these books, I am wary of the series for several reasons. First, in response to the quote about Muslim immigration to the United States and terrorism, Harvey Sicherman, the head of the Foreign Policy Research Institute, said in The Guardian article: “Well, yes, some people did come to the United States to commit terrorism, and I don’t know how one can quarrel with that sentence.” This response is troubling because if the discussion were about immigration, then terrorist activity does not fit in that section. Moreover, the target audience for these books is young and will not necessarily unpack this statement. In other words, they will come to associate terrorism with Muslim Americans, even though they are not responsible. Second, when asked about the timeline of Islam in Europe, Alan Luxenberg, the author of Radical Islam, recognized that the chronology was short, and possibly inaccurate, but insisted that the book is fair. My question is how can the book be fair when significant parts of the history are simply ignored? Third, in response to the pictures of the Muslim girls near the phrase “Security Threats,” Sicherman states that it was not intended and that there are no implications. This would be fine if the cover pictures for several of the books were not so offensive and further emphasized how pictures are being used in this series. On the cover of Muslims in America, there is a darkened mosque against a background of the American flag. Too many pictures representing Islam appear dark and this juxtaposition, I would argue, actually gives a negative impression to the reader that Islam is foreign and something to fear. On the cover of Radical Islam, there is a picture of kuffiyeh and a gun on top of a puddle of blood and a gun is part of the word “Radical” in the title. To have that kind of cover picture is not only provocative in a negative way, but also troubling for a book intended for students in middle school. From the outset of this book, Islam is being contextualized in violence and collapses many different issues into one thing: Radical Islam. Are young students expected to see all the nuances? So, even if there are positive counterpoints, they are couched in too much of the same negativity already associated with Islam and Muslims. What children read is so important because it molds their thinking in the future and books like these further the negative perceptions and hatred towards Muslims that needs to stop. 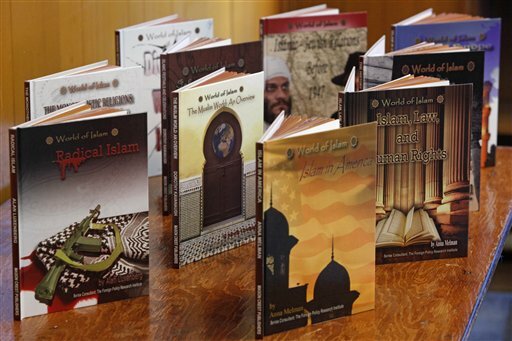 Do you think that Islam is represented fairly in American textbooks? What impact do you think textbooks have on how we see the world? Should violence be included in discussions about Islam only? Please share your thoughts below. This entry was posted in American Muslims and tagged #SSRCWCG, Europe, Muslim Americans, violence by Reem. Bookmark the permalink. Yes, I would say; it is a mystery why many western writers are blinded to see the positive side of islam that would not only have grate ideas but change america for the better. Read quran with right mind then u realise islam and god concept.peace be upon on u.